there are certain stories that athletes tell one another. stories handed down from one generation of competitor to the next. the stories are conveyed in ways sometimes written, sometimes verbal, but always with an air of solemnity and reverence, and invariably with a quiet understanding assumed to only exist between those who have lived the same experiences. the stories are meant to pass on lessons and expectations of performance, of passion, of dedication, of discipline, of effort, and ultimately, of inspiration. of qualities and ideals that every athlete should aspire to. in so doing, the stories become messages, from all those who have come before to all those who have come since, about what it meant for them to live, and about what it should mean for those who still do. the story is written by Kenny Moore, a former Sports Illustrated writer and Olympic athlete. it's about his competitor and personal friend, Mamo Wolde, who ran for Ethiopia in several Olympics starting in the 1960s. i originally came across this story in a 2004 issue of Runner's World. they don't appear to have it in their on-line archives, but i found the story again at the above website. it's not a happy story. in fact, it's quite sad. Mamo Wolde, a member of the Ethiopian army and Emperor Haile Selassie's palace guard, came to world acclaim at the 1968 Olympics in Mexico City, where he won the gold medal in the men's marathon. despite his subsequent fame, he was arrested in 1993 for allegedly participating in the Red Terror executions under the regime of Ethiopia's Mengistu Haile Mariam. he steadfastly maintained his innocence throughout his trial and subsequent imprisonment. 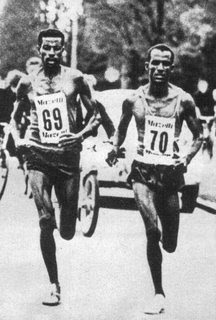 his plight, along with many other detainees of the Ethiopian civil war, became the focus of international humanitarian efforts including human rights groups such as Amnesty International and individual athletes, including his fellow competitors from the 1968 Olympic marathon, Frank Shorter and Kenny Moore. when he was finally released in 2002, Wolde expressed only gratitude for his freedom, saying "i bear no malice towards anyone." what should have been a joyous time, however, soon turned tragic. a few months after his release, he died from complications of a liver disease he had acquired while in prison. the loss to the sports and human rights worlds was large. i should note the better details, and the better story, are in Kenny Moore's article, which is about as touching a tribute as anyone has ever written about an athlete. for that matter, it's about as poignant anything anyone has ever written for any human being. which is why i guess i like this story, and maybe the reason i think about it from time to time--like right now. because it isn't just a story about athletics. or athletes. or running. or competition. or performance. in truth, it's not really about any of those things at all. it's really a story about humanity, and about what that word means in the face of chaos and insanity and brutality and suffering--about what that word means in the midst of utter darkness. and because of this, it's a lesson of just how special and deep and profound and moving human life can be, and of how bright the light of its incandescent majesty truly is. it is as supreme as the sacred...which is what, in its most sublime moments, it actually is. and that's why i want to finish this post from a point in Mamo Wolde's glory, when he was young and triumphant, and his life as bright as the light of victory. it's a story in and of itself, and the kind that sends chills of wonder down your spine. 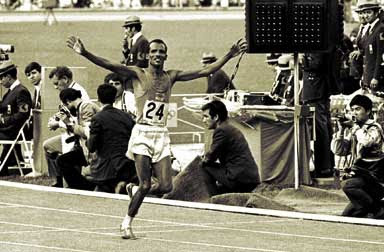 it's from the 1968 Olympics, when he took the mantle of Ethiopian marathon running from the legendary Abebe Bikila. any runner, any athlete, will appreciate this story--but so will any human being aware of things greater than themselves and of the transformative nature of singular moments in time. There's a story all Ethiopia treasures, in which I now learn I had a bit part. It's how their primal champion, Abebe Bikila, having won the 1960 Rome Olympic marathon barefoot (symbolically avenging Mussolini's invasion of Ethiopia in the 1930's), and having won the 1964 Tokyo Olympic marathon in a world record, then set out in the thin air of Mexico City in 1968 to win three Olympics in a row. Your narrator, then 24, green and idolatrous, ran at Bikila's side in the early miles, through a claustrophobic gantlet of screaming, clutching Mejicanos locos. Once, Bikila, protecting his line before a turn, even gave me an elbow. I wanted to say there was no way I'd ever drive him into that crowd, but knew no Amharic. He had tape above one knee. Bikila: "I'm not finishing this race." Bikila: "But Lieutenant, you will win this race." Bikila: "Don't let me down." ...I was in the stadium tunnel, a weeping nurse spraying my feet with merthiolate, when Abebe Bikila emerged from an ambulance. He caught Wolde's eye, came to attention and saluted. Wolde's victory meant his country hadn't produced a lone prodigy, but a succession. Wolde had made the marathon Ethiopia's own.